Colder weather is here again! Tuesday it rained all day, and yesterday was overcast. Today it’s bright and sunny, but a cold front has moved in, and temperatures dropped drastically. It doesn’t seem to bother the animals. Wish I could say the same for myself! 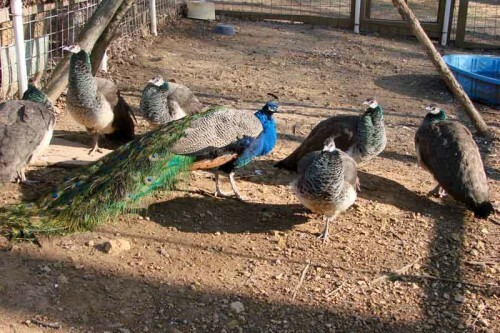 I notice the peacock has pretty well re-feathered, and has nice new plumage in time for courting. He hasn’t starting displaying his lovely fan of feathers yet. The incessant honking that signals breeding season usually starts in February sometime, along with Mr. Peacock dancing and prancing to get the girls attention. Then it’ll be Saturday Night Fever 24/7! When we had that bad storm last week, I took a video of Toby running around like a demented critter, chasing after thunder. Yes, the dog chases after a SOUND. He runs, he barks, he jumps… he thinks he is going to catch it, sometime, somehow. In this first one, you see the lightning flash, and him taking off through the main pasture chasing the noise while sheets of rain blow over him. Here he once again runs through the field, but I caught him when he came back and jumped up against the fence, barking and trying to let that thunder know some day he’s gonna get it! I don’t think there’s a single critter on this farm that’s normal. We’ve had some wild weather here today! For a big part of the afternoon and evening, there was a tornado watch. Thankfully, we didn’t have one, just a lot of rain and straight line winds. Here’s a video of the rain and wind blowing through the trees – these are mature trees, so it was moving some heavy timber! We didn’t get away totally unscathed. A fair size limb blew down out of one of the walnut trees in the back yard. 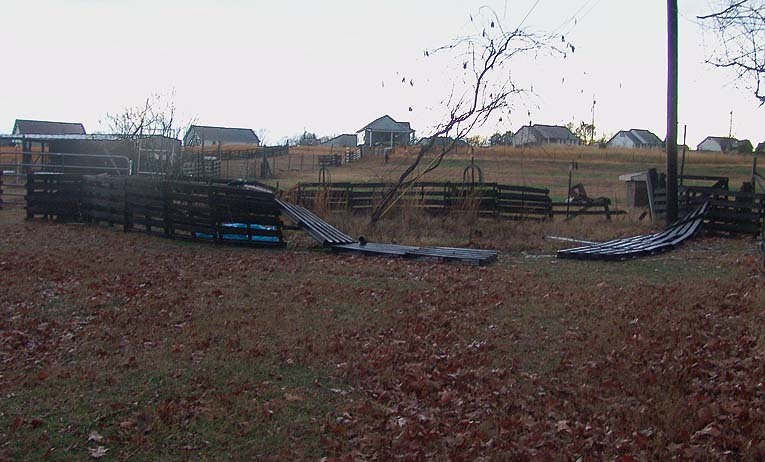 The wind also blew down part of the pallet fence The Farmer built around my lilac bush and trumpet vine to keep the goats from eating them. All things considered, we didn’t fare too badly. Just a lot of wind, and almost 2 inches of rain, which we really need! Perhaps there’s still a silver lining to every cloud? This Polar Bear Club is for the BIRDS!!! I spoke too soon yesterday about being glad I didn’t have to chop ice. Figures. I went out this morning and there were empty heated water bowls in the peafowl pen and poultry pens. That meant I either had to carry water out from the house, which is a fair distance, or chop the ice off the top of the unheated water buckets so I could pour water out of them into the heated buckets. Follow that? I chose the latter, and whew! That’s tiring work. The good news is I had enough water to fill the bowls back up. The bad news is, if it’s still this cold tomorrow, I’ll have no choice but to carry water from the house to the distant water bowls. While I’m chopping through ice to fill water bowls for the domestic fowl, some of their wild cousins are trying out for the Polar Bear Club, and splashing around in the birdbath. 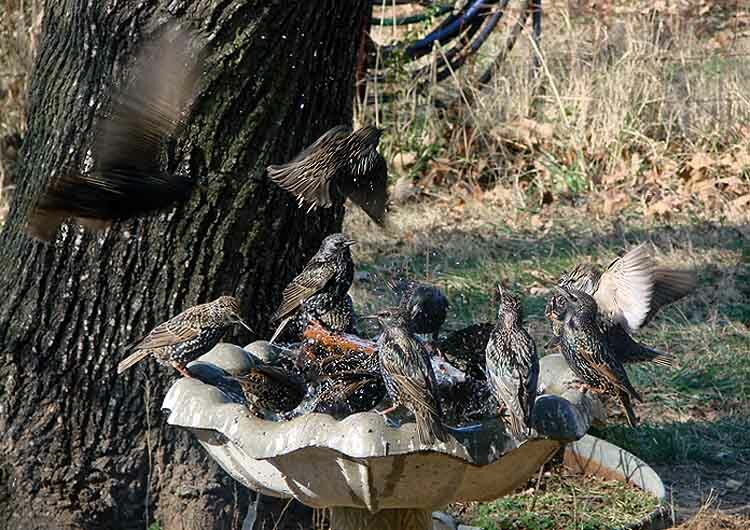 Even though this birdbath has a heater to keep the water from freezing, it’s not THAT warm, and the air is FRIGID. Personally, I think they’re birdbrains to be playing in the water when it’s this cold. I figured I was providing drinking water during the cold weather months for the birds, but never imagined I’d be providing a heated spa! The holidays are over, and it’s back to the old routine. The Farmer went back to work today, which means I have to do morning chores again. Naturally, it also happens to be one of the coldest days we’ve had this winter, with a way wicked wind whipping through clothing. I put on thermal underwear, flannel pants and gym pants. I put on a shirt, sweater and winter coat. I stayed fairly warm, except the wind still managed to slip through the fabrics and spread its’ vile chilliness. The goats weren’t thrilled about moving out, and even the sheep with their way wooly coats were tucked in the shed this morning. Usually the cold doesn’t phase them and they sleep out in the field, but I suspect the wind was whipping through their wool and getting to skin, so they were feeling winter’s bite also. We’ve been missing a hen for a couple of days. I found her this morning in the hen house which I thought The Farmer was looking into every night to see if there were any eggs. You know what they say about assuming things! Our hens are elderly, so I suspect it was just old age. That meant a long trek out into the woods to dispose of the corpus not so delicti (a body, but no crime… and it wasn’t too delicti-delectable looking either). Toby went with me until we got to the electric fence. It wasn’t on, but he doesn’t take any chances and won’t go near it. We never saw it happen, but at some point in time, he must have gotten zapped but good, because we can’t even carry him across without he totally freaks out. It seemed to take forever to get all the animals fed, check water, dispose of a chicken corpse, and otherwise finish up the chores this morning. I’m glad we have heated water buckets so I don’t have to chop ice, and I’m glad I don’t have to shovel snow. There were a few flakes floating around, but not enough to really say it was snowing. And I’m thrilled to be back inside where it’s WARM. I’m afraid I wouldn’t make a very good pioneer!